Download the complete volume for free (2.8 MB, pdf). Buy the printed edition ISBN 978-1-4632-0282-8. The Chief Rabbi of Israel and religious Zionist Abraham I. Kook is well known for having written about evolution. His mystical interpretation of the theory is often presented as a synthetic or complementary model that effectively offered a defence of Judaism in the context of the religion-science debate. But this is not the only context in which one might consider his views on the topic. From a political perspective, one might note his interest in the influence of Darwinism in the thought of secular Jews. And if one gives due weight to his appreciation of secular Zionists' work in building up the Land and combines this with his earlier, often overlooked writings on evolution in which the mystical dimension is missing, then it is possible to suggest that his engagement with evolutionary theory reflected as much a political concern to build bridges between religious and non-religious Zionists as it expressed a theological defence of traditional Judaism against the challenges of modern science. This article examines Zionism and Anti-Zionism in the discourse of key members of the Catholic Guild of Israel, an English Catholic movement for the conversion of the Jews. The central theme in the discourse of the Guild was Jewish ‘power’. It was argued that the Jews had great vitality, zeal and energy, which made them dangerous outside of the Church, but an asset if they could be brought into it. This idea was disseminated by Bede Jarrett and Arthur Day, the two most senior and prolific members of the Guild. Their notions of Jewish power influenced their views about Jews and Zionism. They both saw Jewish power and Zionism as a threat and opportunity, but Jarrett placed the emphasis on threat, whilst Day placed the emphasis on opportunity. One prominent member of the Guild who did not gravitate to their views was Hans Herzl, a convert to Catholicism and the son of the Zionist leader, Theodor Herzl. On the surface Hans adopted the anti-Zionism of Jarrett. Unlike Jarrett, however, Hans believed in Jewish nationalism, although he interpreted it as a spiritual rather than political movement. His ideal Jewish nation was a ‘Christian theocracy of Jewish faith’ with the Pope as sovereign and protector. This article focuses on the phenomenon of second-generation Israeli Holocaust literature, also known as ‘bearing witness’ fiction, that appeared with great resonance on the Hebrew literary scene in the 1980s. It argues that this new band of writers overcame the dual moral obstacles of describing a reality that they did not directly experience and making art of a subject that defies human comprehension. The article focuses on one particularly important novel, Agadat Ha-agamim Ha-atzuvim (The Legend of the Sad Lakes) by Itamar Levy, which tested the limits of representation of the Holocaust and provoked intense debate about its graphic and violent scenes of Jews tortured by the Nazis as well as about its postmodern techniques in portraying the Holocaust experience. The article maintains that despite the fact that Agadat Ha-agamim Ha-atzuvim broke taboos in Israeli Holocaust literature with its disturbing, and perhaps sensational sequences, that at heart Levy’s narrative presents a profound confrontation with the anguished past that affords young readers the necessary gateway to engage with the Holocaust on an individual, rather than a public level. The article makes the case that novels such as Agadat Ha-agamim Ha-atzuvim represent deeply veined journeys into the heart of the Nazi beast, by Israeli writers who are propelled by a wish to unshackle the Shoah from the fetters of the collective and reclaim it as a personal experience. This paper explores the Kabbalistic theosophy of Rabbi Yitzchak Ginsburgh, and allegations of links between his yeshiva and violent political activism and vigilantism. Ginsburgh is head of the yeshiva Od Yosef Chai (Joseph Still Lives) in Samaria/the northern West Bank. His students and colleagues have been accused by the authorities of violence and vandalism against Arabs in the context of ‘price tag’ actions and vigilante attacks, while publications by Ginsburgh and his yeshiva colleagues such as Barukh HaGever (Barukh the Man/Blessed is the Man) and Torat HaMelekh (The King’s Torah) have been accused of inciting racist violence. This paper sketches the yeshiva’s history in the public spotlight and describes the esoteric, Kabbalistic framework behind Ginsburgh’s politics, focusing on his political readings of Zoharic Kabbalah and teachings about the mystical value of spontaneous revenge attacks by ‘the simple Jew’, who acts upon his feelings of righteous indignation without prior reflection. The conclusion explores and attempts to delimit the explanatory power of such mystical teachings in light of the sociological characteristics of the Hilltop Youth most often implicated as price tag ‘operatives’ and existing scholarly models of vigilantism. It also points to aspects of the mystical teachings with potential for special potency in this context. 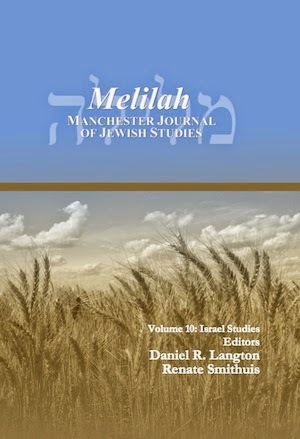 Ghil'ad Zuckermann, Comparative Constructions in "Israeli Hebrew" (Melilah 2006 vol. 3). Giulia Miller, A Surrealist Reading: Formlessness and Non-Differentiation in Yitzhak Orpaz's The Hunting of the Gazelle (Tseyd ha-Tsviyah, 1966) A Cycle of Three Stories (Melilah 2008 vol. 5). Dvir Abramovich, Feminine Images in the Writings of Amos Oz (Melilah 2009 vol. 6). Glenda Abramson, Yitzhak Oren’s Fantastic Science: Two Stories (Melilah 2010 vol. 7).